Overall widths 16" to 42"
For skatewheel and 1-3/8" roller conveyor (light duty). Capacity up to 270 pounds. For all other conveyor types or for stand-alone tables. Capacity up to 620 pounds. 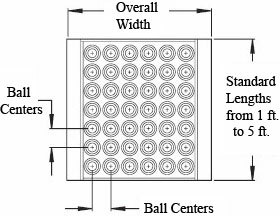 A ball transfer table is used when products are required to be manually rotated or correctly positioned, such as a work station or other similar operation that requires quick, easy handling of the product. Ball transfer tables are also used when more than two conveyor lines converge and packages must be transferred from one line to another. They are widely used on workstation applications to help in assembly, inspection, or testing. Ball transfers make it easy to move or rotate heavy cartons, bins, and components that can be conveyed. Steel channel frame 2.5" Frame for skatewheel and 1-3/8" roller conveyor (light duty) and capacities up to 270 pounds. Select 3.5" Frame for all other conveyor types or for stand-alone tables. Capacity up to 620 pounds.